I painted my brother a housewarming present. He went through a puffin phase as a kid, which was rekindled in Ireland when we learned that puffin is spelled puifin in Irish. 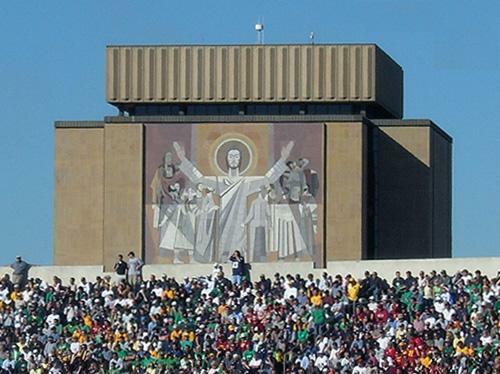 He also went through a Notre Dame phase, but I don’t think I could paint Touchdown Jesus. About two years ago I wrote about my brother Brian taking a softball in the face after it took a bad hop. Well, like brother, like brother. I’m now the proud owner of three stitches aftera similar incident. On this trip to the emergency room, however, Brian wasn’t the patient, he was the doctor. Well, actually he was working in pediatrics and didn’t do the stitches himself as I hoped he would, but he came down and ushered me through the ER. Handy! By the way, along with my stitches, I’m also the proud owner of a really stupid looking moustache/mutton chops amalgam. I drove my brother Brian up to Evanston last night to get his bike out of my parents’ garage. Afterwords we started heading back to the city when Brian asked if I was hungry. “Mustard’s?” I suggested. Mustard’s Last Stand is an Evanston institution that was two blocks from where we grew up and adjacent to Northwestern’s football stadium. Our family ate there a lot — so much that Brian developed a friendship with the grillman, Keith. Keith seems to know everyone in Evanston and the two of them could talk sports indefinitely. Neither of us had been to Mustard’s for probably 10 years, but Keith recognized Brian immediately, recalling his baseball days in high school, his back injury, and of course his infatuation with Notre Dame. As we were leaving, Keith asked Brian to bring in a photo. Keith: We’ll put it up on the wall. Me: (Pointing to a photo of Michael Jordan mid-layup) Maybe you can replace this guy. Keith: You know, we have the only photo in the world of Michael Jordan not dunking. To truly appreciate Keith’s wit and sense of humor, read this article he had in the Sun Times last year. My softball team, Ben Felt and His Traveling All-Stars, is in the second round of the playoffs. (This isn’t the Jellyvision team, but rather a team I’m on with my brothers and some other folks.) Next week we’re going to be playing the team that ended our season last year. The final play was a weak grounder that hit a rock, and subsequently, my brother’s face. The winning run scored, they went on to the next round of the playoffs, and we went to the emergency room. Bri, after taking a ball to the face. I find “3 Years 3 Minutes” especially brilliant. Something about it gets to me, like that commercial with the elephant or the end of A League of Their Own when the ladies are all old.